What Causes Air Pollution? - Do You have any Ideas? What causes air pollution to get worse? Since then, it seems more and more of the earth's surface has become polluted. Earth one (our primitive planet) had the ability to absorb as well as purify minor quantities of pollutants. However, the human population grew and society became more and more industrialized, cars burst onto the scene along with this explosion. We found out the hard way, what causes air pollution. Now it is most urgent that that we learn how to care for our air and work to clean it up. One place to start is by identifying the problem in the first place. 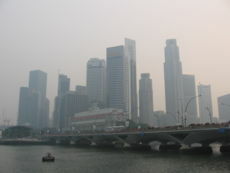 What are the primary air pollutants that we find in most urban areas? Carbon dioxide (CO2) and water vapor are not pollution, even though they contribute to the atmospheric greenhouse effect. See more about CO2 further down on this page. These and other substances remain on the prowl throughout the world's atmosphere and can reach concentrations high enough to warrant our attention. When pollutants become highly concentrated in our air, health and environmental problems follow. It can eventually cause damage to the water supply, flora and fauna. Even more important is the air we breathe, inside and out. Do you have an industrial facility that needs a professional air dispersion modelling assessment? Here's an example of air pollution: watch this black smoke and imagine what it contains. It's a great example of what causes air pollution. Air pollution occurs everywhere - even in your own home and workplace. In recent decades, engineers and builders have been designing buildings to trap heat and conserve the energy used for heating and/or cooling to keep occupants comfortable. This in itself is a good thing but doing so restricts natural circulation of exterior air into the interior space. So, as a result, poor ventilation causes air contaminants to become trapped inside. Mechanical filters sometimes alleviate these problems by removing certain substances, but they are not extremely effective. The entrainment of outdoor air usually works best, provided it is relatively clean air. Need I add any more to the list? Another alarming pollutant lurks in your house. Radon-222 is a colorless, tasteless, odorless and naturally occurring radioactive gas and it creeps into the basement from the ground. Radioactivity leads to cancer. Here are some outdoor air pollution sources. In urban areas, the two major causes of pollution are transportation and fuel combustion. Cars produce high levels of a gas called carbon monoxide in addition to hydrocarbons and nitrogen oxides. Adding to that, fuel combustion inside stationary sources such as heating, power generation and some industries emit sulfur dioxide. People still ask what causes air pollution regarding carbon dioxide. In fact, the most talked-about substance in the air these days is carbon dioxide. Two of the main issues here are deforestation, the removal of sequestration opportunities, and the burning of fossil fuels, a strong source of CO2. Sequestration is the filtering CO2 out of the air, and it's something plants do naturally. They need it for their own growth. As a result of human processes and changes to the natural ecosystem, net emissions of carbon dioxide have been increasing at a rate of 4% annually. Ocean water holds approximately 60 times as much carbon dioxide as the atmosphere. That is a whopping amount. Once the oceans can no longer absorb carbon dioxide because of saturation, then the excess CO2 will remain in the atmosphere. One of the causes for concern here is that as the temperature of the water increases, the ability for the water to absorb CO2 decreases. The basic connection between this gas and global warming goes as follows. Carbon dioxide is a good transmitter of sunlight energy. However, it partially restricts radiative energy returning from earth back into space where we think it belongs. Everyone has heard of the greenhouse effect, right? This keeps the earth from getting drastically cooled during the night. As the amount of CO2 increases in the atmosphere, a warming of the atmosphere near the earth's surface has been expected to occur. Right now, increased CO2 concentrations may cause a significant percentage of global warming. Have I got the Wrong Idea? Maybe you know something I don't. Something the world needs to hear about. This short website cannot include everything and if it's important to you, it's important to me. So what's really the story with global warming? I'd like to know. If you have a picture, I'll even include it here. Try me. A good idea deserves a good title. Put it here. Go ahead and type!... There's no registration or login required. Wrap a word in square brackets to make it appear bold. For example [my story] would show as my story on the Web page containing your story. TIP: Include your best thoughts in your first paragraph if you can. Do you have a picture to add? I would appreciate that. Hit the button and find it on your computer. Then select it. Only .jpg's work here. What have those who came before you said? What causes air pollution from Smog? Smog has started to make an appearance in tropical and subtropical regions where savanna grasses burn periodically. What causes air pollution and smog? 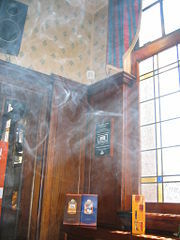 Its unpleasant properties comes from unburned gases emitted by our usual suspects: engines and other combustion sources. I am sure you have heard of ozone! This is a gas created by nitrogen dioxide when it gets exposed to sunlight. This gas can cause eye irritation, damage to trees and crops and impaired lung function. We also have industrial smog. Need I elaborate on that? Just take a look at our industrial facilities. What can you do to reduce global air pollution? Driving a vehicle that gets at least 35 miles per gallon, bicycling, walking, and by using mass transit are good ways to start. You can try to make your home more energy efficient as well. Begin a recycling campaign. Plant a few trees. You can also support stricter clean air laws. Want a bit more about the benefits of recycling? See this website on recycling and Global Climate Change. Learn about what is climate change, what causes it, and how you can play a part to reduce climate change through green living, recycling and energy efficient efforts. Earth is the home to everyone and no one likes to live in a dirty home. Together, it is possible to make the earth a healthier, cleaner and more pleasant environment in which to live. Need to know about causes of air pollution?